MKU and EDIC Caracal signed a MoU for strategic co-operation for manufacture of the advanced CAR 817AR rifles in India at Defexpo 2018 in Chennai. The special gas piston based design of CAR 817AR makes it more rugged and stable in harsh conditions like mud, sand etc. and its mettle has been proven in the UAE. The Assault Rifle will be manufactured in India at MKU’s proposed facility in Kanpur, Uttar Pradesh under the ‘Make in India’ initiative of the government and will be offered to the Indian Army for their requirements. The MoU also covers mutual cooperation in promoting MKU Electro Optics and Armour to the UAE forces by EDIC Caracal, a conglomerate and powerhouse of Emirates Defence Industrial Company (EDIC) with more than 16 assets spread across various defence industrial segments in UAE. On the occasion, Mr. Neeraj Gupta, MD of MKU said, "We look forward to a strong association with EDIC Caracal. This association will further strengthen each other’s product range for India and the Middle East. 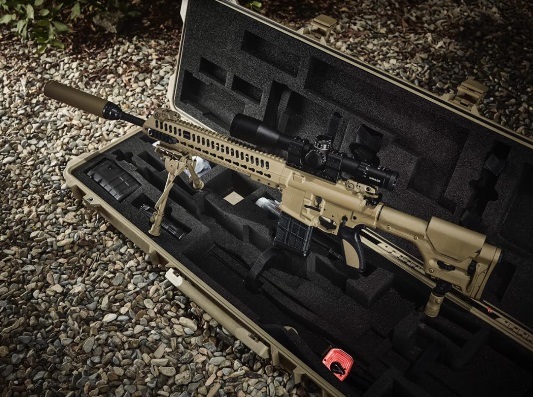 The CAR 817AR rifle is a rugged and versatile product and will meet all the requirements of our armed forces." Mr. Hamad Salem Al Ameri, Chief Executive Officer of Caracal said, "Our respective governments already have strong relationships, We hope that this cooperation with MKU will become a starting point for a large strategic defence cooperation between both countries that opens the door for many more potential partnerships." Fahad Abdulrahman Eisa, Senior Manager, Business Development, Caracal added "India is one of the largest and most promising markets in the world and MKU is an ideal partner with its experience and excellent credentials in defence manufacturing here. MKU already has existing products which are much required in UAE. We are very positive that this association will see great heights." This will be the 2nd manufacturing base for Caracal in Asia. Its weapons are currently deployed with various forces in UAE. The CAR 817AR passes all international standards and specifications and is proven to perform excellently even in the harsh conditions in Middle East. MKU Limited is a leading defence company in India with a footprint in over 100 countries. It offers advanced solutions in Electro Optics, Passive and Active protection for platforms against rocket propelled grenades and blasts from mine. It is a global leader in armour for soldiers and platforms globally and has protected over 2 million soldiers and 2000+ platforms till date. It is already supplying night vision devices to Special Forces, CAPFs and State Police Forces in India. Caracal International is a company with the largest footprint across many continents like Africa, Europe, North America, South America and Asia. It is part of EDIC (Emirates Defence Industrial Company) with more than 16 assets spread across various defence industrial segments in UAE. Caracal manufactures a full range of small arms starting from pistols sub machine guns, assault rifles and snipers with different calibers and barrel lengths. Their weapons are already in service with many armies in the Middle East. Sony's play station 5 arrives! Sony's next PlayStation which is called as PlayStation 5, will have better load speeds, graphics and audio and while the release of this model is planned next year, some of the important details on the prominent features are as follows.